My life is not and never yet has been one in which the Sunday sunrise offers complacencies or green freedom ... though I have found other ways to dissipate the holy hush. Around ten past nine every Sunday my son Alex and I take the ten minute drive from our home down Wisconsin Avenue to Temple Micah, in a quiet area of DC called Glover Park. We buy a bagel and share it before entering the sanctuary, where we sing some Hebrew songs and listen to a brief, hilarious, and profoundly philosophical meditation on this week's Torah portion by the rabbi. I leave Alex at 10:00 for his class, focusing upon a Deep Issue (today was death and the the nebulousness of Jewish conceptions of the afterlife), followed by a unit on Israel (as problem rather than as propaganda). He typically enjoys both. While my son is being indoctrinated into Good Jewdom, I take my book bag and hike alo ng Wisconsin Avenue south into Georgetown. The walk is beautiful, a highlight of my day. 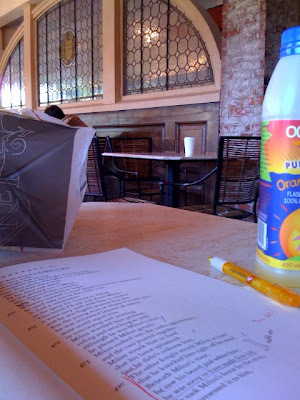 I stop at the Marvelous Market at P St, buy a coffee and an orange muffin, and read frantically from whatever text I am going to lecture on to eighty students come Monday morning. I say frantically because no matter how many times I've taught a work, I still obsess the previous day about how to make the coming class one which my students will not -- amid the deluge of demands for their attention -- quickly forget. 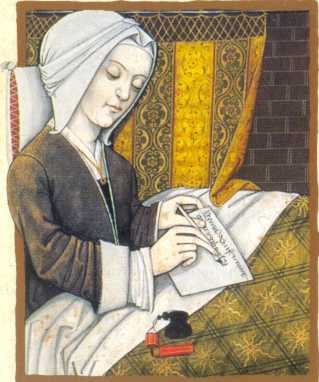 Today I was reading Marie de France; tomorrow I teach the final six of her lais. 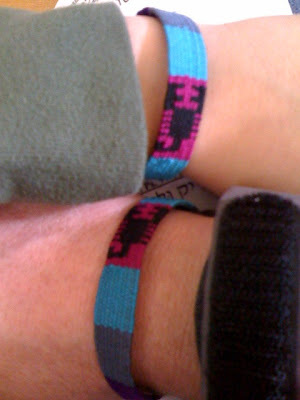 As I sat in the café thinking about my thinking about Marie, I flashed back to a picture I'd snapped at Temple, when Alex placed his hand over mine and crisscrossed our Mayan friendship bracelets (his gift to me last December). I'd glanced at the space between the two arms, and saw Hebrew letters peeking through -- an inscrutable allegory, I thought, suggesting some moral about endurance and history, about alliances with things and words and generations that you can know imperfectly, if at all (dark encroachments, old catastrophes). I then looked at the words of Marie's lai Yonec, a story about a woman imprisoned in a tower and saved from her hated solitude by a hawk who transforms into the king of a distant land. This visitor promises her a realm that has so far been denied to her, a realm possessed of histories and stories she can only imperfectly know. I thought how strange that something so fragile as a poem of love and transformation should have survived eight hundred years, and still speak of worlds as yet uncomprehended. And that is what my lecture will focus upon tomorrow: how at the moment in the lai when the lady feels so imprisoned in her present life that she will never escape its constriction, she dreams a past full of possibility and a bird arrives (not a cockatoo, but an avian full of green freedom nonetheless) to lead her to unimagined futures. That's what I like about the scorpion bracelets from Mexico resting upon a Hebrew song ... a song that Alex and I have not been asked to sing reverently, but that we do sing well. Beautiful post. The wonderful rituals of home, and the everyday (or the everyweek, I suppose). This is exactly the kind of thing that we miss most when travelling, isn't it? I also sympathise with the ritual of pre-class panic. We've just started semester here and so the challenge of re-inventing my subject afresh is uppermost in my mind, apart from the dreadful nerves that beset me for three days until I actually walk into the classroom and they disappear. I'm lecturing on Helgeland's Knight's Tale this week and am surprised I am finding new things to think and say about it. Not, perhaps, because it's a great film, in the way that Yonec is a great lai, or that Troilus and Criseyde is a great poem. But it is a great film for a subject on contemporary medievalism! Jeffrey, this is a wonderful post. Since "Yonec" also includes the *promise* of revenge by a son for the heroine's past imprisonment, and then the son actually does show up and do just that, but after our heroine has died, the story, in relation to everything you have said here, is wonderfully rich in terms of temporalities. Really lovely post, Jeffrey. Those rituals are the most important moments, when it seems you're doing nothing, really, but doing it together, with your child. Lovely. I still find myself in awe when you say things like "the last six of Marie's lais today" because I guess I'm now on the 'less is more' bandwagon, pedagogically speaking. (Or maybe it's just my convenient rationalization for trying not to stress about preparation.) I wrestle with this every time I do any kind of survey: Do I fit into the term all the things I think students need to know and risk moving too far too fast? Or do I slow down a bit and cover few things more thoroughly? I'm sure you know the dilemma. Lately, I've been cutting back - going over just just Guigmar and Lanval and then having students meet in groups and present over the others or, other semesters, having them read on their own and compare and contrast one we do in class with another they've read on their own. Seems to work though it does give me more grading. I don't get the pre-class jitters so much but it's probably because I'm not paying enough attention. It's also prolly just my own weird thought processes but after panicking as an undergrad a couple of times when I came into a test having studied obsessively but suddenly, at that moment before the test, feeling I knew absolutely nothing, it all just came spilling out. I'm kinda that way now with class, so when I'm sure I know absolutely nothing (which is most of the time) I don't panic anymore. Another healthy rationalization for keeping incipient dementia at bay. A brand new class is another story. And Stephanie, I couldn't help but snort at "that Yonec is a great lai." We've never met and I *swear* I'm really not that juvenile ... usually ... unless it's for effect ... or ... well. Thanks, Stephanie, and good luck with the instigation of teaching. Holly Crocker taught me a while ago how useful to think with Helgeland's Knight's Tale is, but I haven't had the chance to bring it into my classroom yet. To teach Marie I did use the terry Gilliam classic The Fisher King, and that worked amazingly well. It's so Yonec-like in parts that Marie de France could have composed the script. Dan, my course is not as ambitious as it appears: the students get a total of two weeks (four classes) on the twelve lais. Two of these 75 minute classes are me lecturing ton the group of 80 (though with a fair amount of Very Large Group discussion), and two are led in sections of twenty by some excellent, excellent graduate students. So they get plenty of time to linger, with different voices and different formats.